The Monterey Bay Shoreline Guide With Special Notes on the Monterey National Marine Sanctuary. This is an indispensable reference to one of the most spectacular stretches of California's coastline. Beginning in the north with Point Año Nuevo and ending some 120 miles to the south at Point Sur, Jerry Emory provides a comprehensive guide to the natural, cultural, and historical riches of the greater Monterey Bay shore. Six regional maps provide detailed information for visitors exploring by car, bike, public transportation, or on foot. Highlights of the area include the elephant seals of Año Nuevo; surfing in Santa Cruz; the Monterey Bay National Marine Sanctuary, largest marine sanctuary in the U.S.; the world famous Monterey Bay Aquarium; and the breathtaking coastal mountains of Big Sur. The coast offers beautiful beaches and dunes, excellent tidepooling and birding, glimpses of sea otters, monarch butterflies, and gray whales on their migrating paths, redwood forests and agricultural landscapes, vineyards, parklands, literary landmarks, and towns and cities to explore. Monterey Bay's human history is equally captivating and includes coastal Indians, Spanish missionaries, and Mexican rancheros. 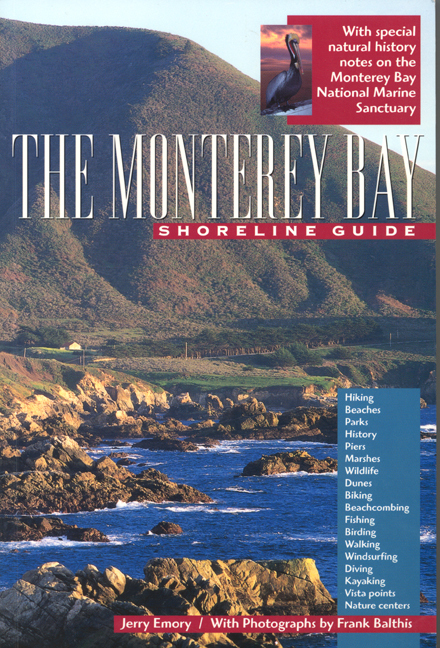 Richly illustrated with 181 color photos, The Monterey Bay Shoreline Guide has helpful "Getting Around" sections providing public access directions and mileage and "Information" sections with useful phone numbers and website addresses. Jerry Emory is author of the San Francisco Bay Shoreline Guide (California, 1995) and several children's books, and is coauthor of Bay Area Backroads (1999). He lives in Mill Valley, California. Photographer Frank Balthis lives in Davenport, California. He specializes in wildlife, natural history, environment, and travel.